Video games, and the culture that surrounds them, are in the middle of a phase of enormous evolution. What started as a niche hobby for nerdy guys in arcades has become one of the driving forces in the media. Most people play some sort of game, even if it’s just the fun little novelties that come with their phone. Games are bringing in more money than movies and television combined. And E-sports gaming competitions have come to rival traditional sports in terms of audience and exposure. And we tell kids not to waste time playing games. Gaming's growing presence is slowly starting to bleed into everything, which is becoming more and more clear at places like E-bash — one of Indy’s go-to places for competitive gaming. Located in the heart of Castleton, E-bash is an amazing blend of old and new. After the death of the quarter-run video arcade and the rise the internet, gaming has started to become a largely faceless hobby. The vast majority of multiplayer gaming now takes place online with headset based communication. This has led to gaming losing its personal touch, and to people being absolute monsters to each other on the internet. If you’ve spent more than five minutes on any online multiplayer server with chat enabled, you know exactly what I mean. Essentially, eBash is the modern form of an old school video arcade. It’s a place where you can walk in, pay a few bucks, and play games alongside a bunch of other people just like in the old days. Except, instead of arcade cabinets, you have pcs and consoles set up at TV displays. The setup is cool and approachable, with awesome couches, a nice, well lit atmosphere, and a kickass fish tank. In one corner, you have the pc rigs, set up in a way so that teams can game together or against each other as a unit. This is really great for competitions, as there’s nothing better than being able to turn to your co op partner and give them a physical high five. 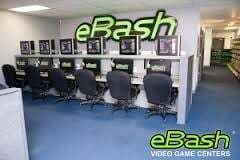 eBash offers a variety of gaming services and experiences. They do birthday parties, for the tech savvy kids and for really, really cool parents. They host a variety of gaming tournaments, for games ranging from Dota 2, League of Legends and even Call of Duty. Some of these are for money, others just as friendly competitions. One of their most popular gaming get together is that for Super Smash Bros, which gathers every Sunday. In the summer, they offer children’s camps “Create and Play”. This is a week long camp for kids between the ages of eight and sixteen, where there taught the basics of programming and how it coincides with game design. Seeing how important computer skills are becoming to most careers, both inside and outside the realm of game design, this could be invaluable to youngsters. And, you know, it’s something they’ll actually be interested in learning due to its gaming connection. During racing season, they have racing simulators set up at the speedway, which are free to use for all attendees. They even have a theater in the back to watch streamed gaming tournaments, like the aforementioned Dota International. eBash’s greatest appeal, even more so than all the awesome stuff they offer and the sheer fact of their existence (seriously, had this been around when I was fourteen I’d have spent most of my time there), is it’s accessibility. You can just walk in and try out a game. It’s an open and welcoming environment. Gaming, especially on the internet, can be an incredibly toxic atmosphere that’s less than welcoming to newcomers, or even old comers. eBash has none of that, as it brings back the face to face interaction of old school arcades and updates it for a modern audience. In person social interaction adds immeasurably to the gaming experience, whether it be to compete with a team of well acquainted comrades, or even to meet new people. That’s something that manager Zack Johnson and his staff members are dedicated to, creating a nice, fun environment for people to enjoy games together. And cheesy as it sounds, that’s what it’s all about in the end. Making friends and having fun. And dear God, gaming sure could use some more of that nowadays.